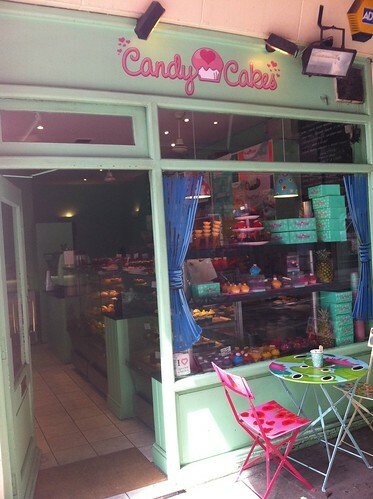 Peering into the window of what you would take on face value as a cake shop, you see cupcakes topped with plastic looking fluorescent icing. Not immediately appetising. Not even the cutesy decorations crafted out of marzipan is going to draw the discerning lunch crowd in. Which is actually a real shame, as inside is a notable addition to the Covent Garden lunch options. Drawn in by the desire for a freshly squeezed fruit juice to quench my thirst in the Summer heat (I know, we did have a couple of days which could have been considered Summer), I was surprised to see a rather enticing selection of sandwiches. 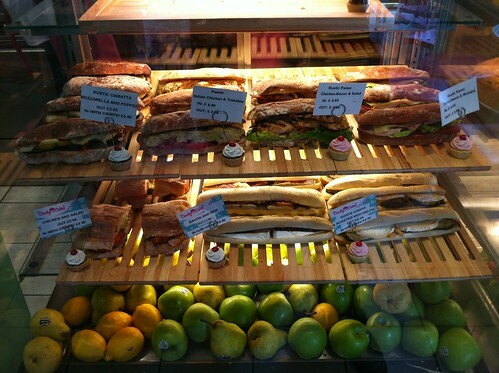 Each at no more than £3.95, they are freshly made and packed with fillings, with a distinct lack of overwhelming mayo. Take that Pret! And don't rule out the salads either. With a selection of 6 different varieties (where you can choose a total of 3 to fit into your salad box), it's a filling meal. Take into consideration the home made houmous with a toasted pitta bread, and you're going to be equally full and pleased with your lunch. Look past the lurid frontage and plastic looking cakes and you have a notable addition to my Covent Garden lunch options. Thanks for this, I've walked past this place a thousand times and thought "Urgh, they look *disgusting*" and carried on walking. Such a shame, really. I shall remedy my mistake posthaste. Sadly though, the cakes are terrible. I went to the one in Covent Garden and there were boxes of them pre-packed out the back. They were really dry and the icing was very synthetic tasting.